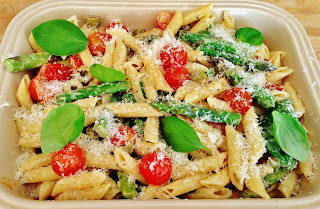 A delicious pasta dish which is full of crisp, fresh summer flavours and is very quick & easy to make! 1. In a large pan of salted water, cook the pasta as per packet instructions, drain and set aside. 2. Meanwhile make the sauce, in a large frying pan heat the olive oil with the garlic and add the chopped asparagus. Cook gently turning occasionally for 7-8 minutes or until al dente. 3. Add the olives and tomatoes to the asparagus and heat through. Now add the mascarpone and lemon zest and stir through. Season to taste and add the butter and a squeeze of lemon juice. 8. Add the cooked pasta to the sauce and stir through. Place in a warmed serving dish and scatter with some of the grated cheese and sprinkle with basil. 9. Place the remainder of the cheese in a bowl so the guests can help themselves and serve. Enjoy!